Whether or not you love its distinctive tangy, spicy taste, Sriracha sauce has certainly become a cultural phenomenon. The red and green bottle is instantly recognizable. And that rooster, well, there's a story behind that rooster. 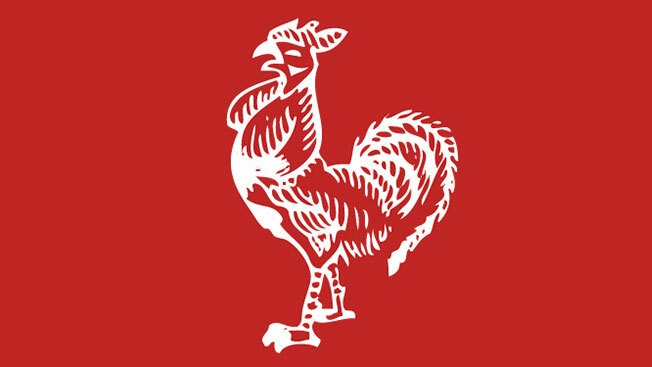 The rooster is a symbol of strength. David Tran, founder of Sriracha maker Huy Fong Foods, was born in 1945, a year of the rooster, according to the Chinese Zodiac calendar. For Tran, the rooster represents his tenacity. "I've had a tough life from being a refugee in Vietnam," he tells Modern Farmer, "so I’m trying to show that I’m strong—you know, I persevere." Back in the '70s in Vietnam, Tran saw a street artist and asked him to draw a rooster. He kept that sketch with him for years and used it to label the caps on the bottles of his original chili pepper sauce. Years later, after he fled to the U.S., he had an artist draw a larger version from the original. That bird is now part of the iconic Sriracha bottle design which is also on socks, iPhone cases and water bottles. So, who was the original artist? Tran never asked the man's name. "Even me, I don’t remember who he is," he says. The brand may not boast huge social media numbers, but as demonstated by the post above, it has a loyal customer base that loves to show off the brand's bottle. The family business began in the U.S. in the 1980s after Tran fled from Vietnam, and it's still made in the U.S. The sauces are made from red jalapeño chili peppers and don't have water or artificial flavors. The name Huy Fong Foods comes from the vessel that carried Tran over from Vietnam.